To achieve desired public outcomes, governments around the world are using behavioural insights in the development of public policies. Behavioural insights inform public institutions by combining knowledge and research methods from behavioural science fields such as psychology, economics, sociology, and neuroscience. Insights gained into how people actually behave can help inform public policy levers, potentially yielding more effective and representative policies and programs. In 1979, Daniel Kahneman and Amos Tversky published a paper on prospect theory, which challenged some of the assumptions of perfect rationality put forward in neo-classical economic theory. Rational choice theory assumes individuals take into account all available information and make self-interested decisions on a consistent basis over time. This assumption has formed the basis of many policies in the past. However, behavioural insights have challenged this premise through evidence-based experiments and shown that individuals aren’t quite the selfish utility-maximizers described in economic theory. The application of behavioural insights is an experimental, evidence-based and iterative process. 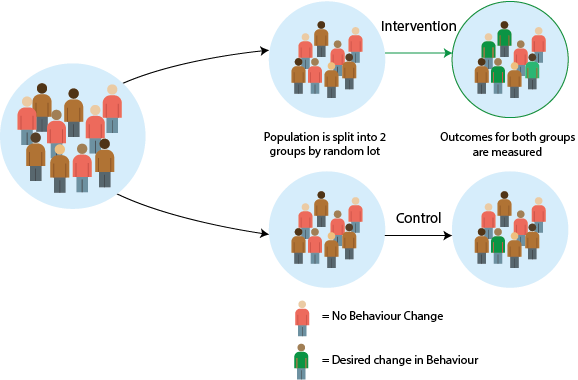 One of the central tools used in developing behaviourally-informed interventions are randomized control trials (UK Behavioural Insights Team – RCTs). These experimental studies are used to i) assess the effectiveness of policy interventions by comparing a control group and a group which receives an intervention ii) collect the data, and iii) evaluate the effects of the intervention. Furthermore, RCTs help the researcher or policymaker to identify causal conclusions, isolate the effects of a behavioural intervention on a smaller scale and, if necessary, recalibrate the intervention. Above is an icon representation of a population of people. On the left side there is a group of people. The population is split into two groups by a random lot. One group receives an intervention and the other group is a control group. The outcomes for both groups are measured. Nudges offer a cost-effective policymaking tool that can complement or replace traditional policymaking levers such as regulations, information or tax/investment-based incentives. System 1 thinking is very effective in allowing individuals to come to quick conclusions under limited circumstances. Heuristics, i.e. cognitive shortcuts that help process vast amounts of information quickly, form the basis of making quick decisions by helping the mind take leaps in judgement without drudging through a slow process of deliberative thinking. While overwhelmingly effective in addressing short-term issues, System 1 thinking lacks the capacity to think in the long-term and has limited reflexive capacity. Having a conversation, catching a ball, and driving a car are examples of activities that use system 1 thinking. System 2 provides oversight over System 1 thinking by having the capacity to take careful and thoughtful consideration of information to draw conclusions. However, as System 2 thinking is more of a strain cognitively, it tends to defer to System 1 thinking for most day to day tasks, stepping in when called for. The difference between the two can be seen in the thought process behind driving a car (System 1) vs. parking a car (System 2). As described in Cass Sunstein and Richard Thaler’s 2015 book “Wiser”, behavioural insights also have the potential to be applied within an organization. This includes government administrative and decision making processes since both public and private institutions are heavily influenced by a range of individual cognitive biases which can be exacerbated in a group setting. Consequently, greater efforts to address these biases can go a long way in fostering effective decision making and high performing organizations (for example, countering status quo bias to help increase adoption rates of new tools and programs). Close to 200 cognitive biases been documented; however, many are similar or simply have a different name. Regardless, there are several biases pertinent to organizations that are worth noting. Anchoring bias: people often judge things relative to some arbitrary reference point. For example, individuals tend to be over-reliant on the first piece of information they hear and often come back to that initial assumption even after further reflection. A classic example is salary negotiations, where the initial salary range stated by either party anchors the range of possibilities in the mind of both the employer and employee. Bandwagon effect: individuals are more likely to adopt views that are widely supported and echoed by others. Sometimes described as groupthink, similar effects are often seen in the context of meetings, where vocal individuals steer outcomes to correspond with their own opinions. Blind-spot bias: people have a tendency to overlook how biases play a role in their own decisions. A multi-university study, published in Management Science, revealed that in a survey of 600 Americans, a full 85% believed they were less susceptible to biases than the average person! Confirmation bias: individuals are more likely to accept information if it corresponds to their preconceived views. The narratives surrounding weapons of mass-destruction preceding the war in Iraq are commonly viewed as an example of confirmation bias. Conservatism bias: new evidence is more likely to be scrutinized and treated with disbelief than established information. Galileo’s push for a heleo-centric model over the assumed geo-centric tradition of astronomy demonstrated how difficult it is to overturn established principles. Individuals and organizations are often unaware of the extent biases influence decision making, thus de-biasing efforts within organizations can go a long way in optimizing decision-making processes. Training individuals to learn about and identify their biases from the outset can de-bias decision making both in the short and long term. A combination of games and videos has been noted to have significant de-biasing effects, with some trials demonstrating an elimination or muting of instances of targeted biases (Morewedge 2016). Strategically presented choices that consider what and how information is presented can significantly influence how decisions are made. Shifts in how the choices are structured help to address biases that would otherwise lead to sub-optimal decisions. Similarly, how information is framed or anchored can also be very effective, as is the case for a well-structured narrative. Providing individuals with the right information and not just more information helps to provide the necessary building blocks for sound decision making. Information or messages should ideally be presented in a manner that is easy, attractive, social and/or timely for the most optimal impact. The UK government has a handy guide to its “EAST” approach. Similarly, incentives can play a huge role in choice architecture, influencing how decisions are made and having a significant effect on process and outcomes. Monetary and social rewards both offer tangible benefits that can help bring about desired behavioural changes. However, if incentives are badly designed by not taking into account actual human behaviour (have poor framing or are not reflective of intentions), they may be ineffective, costly or even counterproductive in the long run. Physical and electronic infrastructure can be yet another element of choice architecture. Policy is not only embedded in government services, but also in infrastructure and objects, ranging from the digital infrastructure of a government website to the construction of museums. How they are designed can have an impact on human behaviour. For example user-centric design can make it fun to recycle and footprints leading towards stairways and motivational messages in stairways can nudge people towards healthy activities. Architects and planners have the opportunity to influence human behaviour through the environments they construct, whether those are small workplaces or whole cities. Around the world, eco-cities are being designed using initiatives like alternative transportation systems, renewable resources and energy systems that have zero-waste. Human behaviour change is a key component of this green revolution because if innovations are imposed on people who do not know how or why to use them, they will simply transfer their old consumptive lifestyles to the new sustainable cities. Co-created solutions inspired by open policy-making tools and cross-governmental innovation labs are also gaining popularity. Open policy aims to ensure policy is more informed and better designed for both the government and users through collaborative approaches which bring together a broad range of input and expertise. It draws on new analytical techniques, behavioural insights and digital tools that are both quantitative and qualitative. People in organizations can benefit from a safe, collaborative place where they can ideate, experiment, and prototype creative new solutions with a variety of people from inside and outside the organization. By bringing in individuals and stakeholders from outside of government, it not only provides better outcomes, but also builds early buy-in at the beginning of the policy-making process. The exposure to outside ideas enables government to ward off internal organizational biases by challenging its policy prescriptions against models held by external stakeholders. For example, Denmark’s MindLab collaborates with citizens and businesses to design new solutions for society. It also offers a course that combines creative arts and technology to solve real world problems. Ethnography (the systematic study of people and culture) is being used by the French government to inform the development of behavioural insights. Creative arts (such as performance arts, photography, music, creative literature, and visual arts), as well as symbols and branding, can have the power to evoke powerful emotions and influence behaviour. The Rockefeller Foundation and ideas42 (a non-profit behavioural science design and consulting firm) brought together creative artists like cartoonists and rap artists for a month-long residency to work with professors and researchers to address complex social problems through behavioural insights and to find ways to reach out to target groups such as youth. Technology can steer individual behaviours or drive change, impacting whole industries, cultures and societies. For example, the digital revolution is having an enormous impact on society. Advances in technology have made it easier to track behavioural changes on a macro-level and have given unprecedented levels of insight into how these interactions take place. The emergence of big data and artificial intelligence and the ability to catalogue and detail behaviour will open up new kinds of insights and opportunities in psychological research and the domain of decision making. Within the context of policymaking, behavioural science has seen significant growth since the UK’s Behavioural Insights Team’s inception in 2010. Now found around the world in countries like Australia, Denmark, France, Germany, Singapore, Qatar, the US, and Canada, a broader community of practice has grown to provide a wide-range of examples of behavioural science applications in policy. The White House’s Social and Behavioral Sciences Team developed two interventions targeting student-aged individuals: the first dealing with the college financial aid application, the second with student loan repayment. The first initiative sent personalized text messages to students to remind individuals to fill out the necessary forms for financial aid, increasing college enrollment by 5.7%. The second targeted student loan borrowers who had missed their first payment. Individuals were sent a reminder email, resulting in a 29.6% increase in borrowers who made a payment following the intervention. Both represent a low-cost and effective means of increasing program efficiency. The Collections Directorate of the Canada Revenue Agency conducted an experiment to test the responsiveness of Canadians when including nudge messaging in collection letters to individuals who had personal income tax debt due. Inspired by the UK’s experiments on taxpayer compliance and collection, the CRA proceeded to test out the effectiveness of different wordings and its response to compliance. Following the 30-day trial, the CRA saw the wording changes collect 12% more than the initial letters; if scaled up appropriately, it could see a potential increase of $1,000,000 collected in a timelier manner. 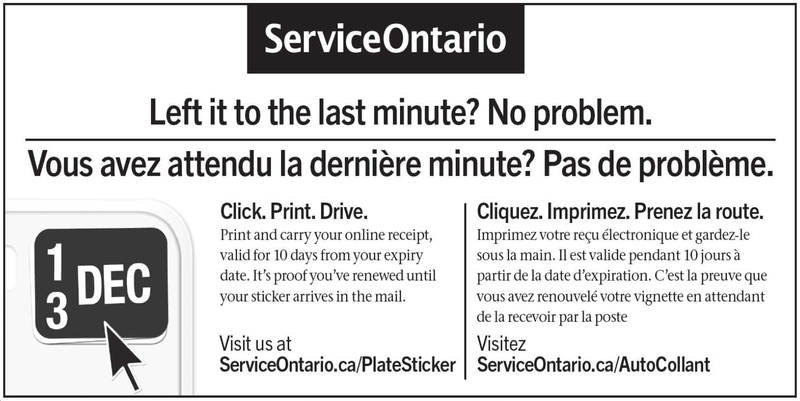 In 2013, only 10.4% of the province’s 6.5 million license plate renewals were conducted online. While this figure has continued to grow since the option of online registration was provided in 2010, program uptake has been limited. By simply changing the messaging on the renewal form to highlight online renewal options, the government’s study saw an increased uptake of 4.3%, saving the government approximately $28,000. If scaled up, the intervention has the potential to save $612,196 moving forward. Source: BSPA article, Moving citizens online: Using salience & message framing to motivate behavior change, March 16, 2016. Algate, F., Gallagher, R., Hallsworth, M., Halpern, D., Nguyen, S., Ruda, S., Sanders, M., Service, O., with Gyani, A., Harper, H., Kirkman, E., Pelenur, M., and Reinhard, J. 2014. EAST: Four simple ways to apply behavioural insights. U.K. Cabinet Office and Nesta. Almeida, S., Ciriolo,E , Lourenço, J., and Troussard, X. 2016. Behavioural insights applied to policy: European Report 2016. JRC Science Hub, European Union. Goldacre, B., Haynes, L., Service, O., and Torgerson, D. 2013. Test, Learn, Adapt: Developing Public Policy with Randomised Control Trials. U.K. Cabinet Office. Hastie, R. and Sunstein, C., 2015. Wiser: Getting Beyond Groupthink to Make Groups Smarter, Harvard Business Review Press. Sunstein, C. and Thaler, R. 2008. Nudge. Yale University Press. Agile Policy on Complex Terrains – Nudge or Nuzzle?